The trolleybus no. 13 of the Czech type ŠKODA 9 Tr0 was reconstructed in February 1969 by the Eberswalder Verkehrsbetriebe (public utility). The trolleybus was sold in 1977 as summer house or caravan for building sites. This photo show the trolleybus no. 13 of the Czech type ŠKODA 9 Tr0 with trailer of the GDR-type W 701 at the crossing Freienwalder Straße/Saarstraße in July 1970. Here was until 1945 the branch to the Artilleriekaserne (artillerie barracks). The trailer had always the ivory colour. From 1970 the traditional green-white colour of the Eberswalde vehicles were replaced by the ivory colour. The articulated trolleybus no. 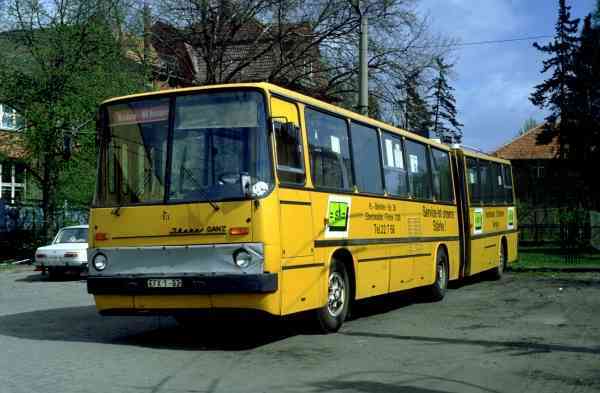 013 of the Hungarian type Ikarus 280.93 was put or stored away defective from 07 March 1986 to 29 December 1986. The last day in use was the trolleybus on 05 August 1993. The trolleybus was scrapped on 23 March 1995. The photo show the articulated trolleybus no. 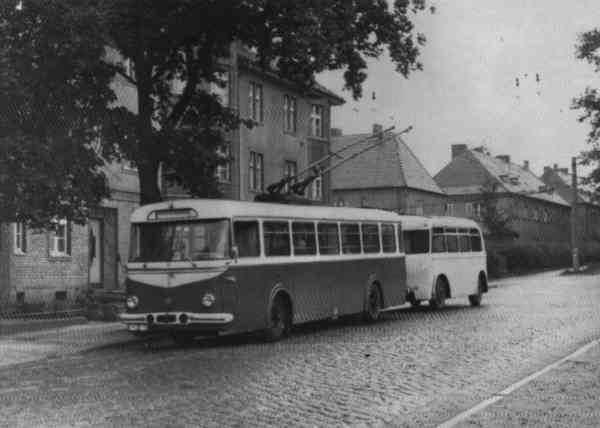 013 of the Hungarian type Ikarus 280.93 at the old depot Eberswalde Bergerstraße.